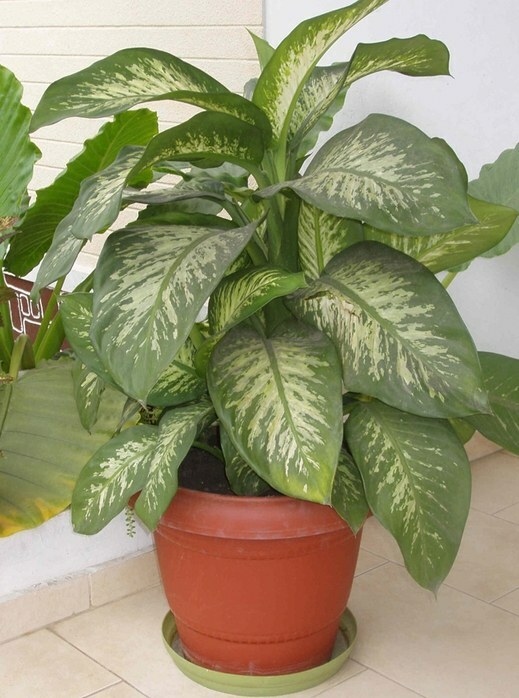 Dieffenbachia - a great plant for apartments and offices. It pleases the lush variegated greens and vigorous growth. For the year you can grow from a tiny seedling of five-foot giant. But, unfortunately, in the dry air of the room she quickly laid bare, and instead of a magnificent Bush you have – long-legged beast with a curved trunk and a bunch of leaves on top. To return dieffenbachia decorative, will have to trim it regularly. Pruning is recommended for fairly Mature plants, the stem of which reached a thickness of 2-3 cm in diameter. On the bare trunk, nothing will grow, so make the cut as low as possible. Make sure that on the stump remained dormant buds. They look like a hole or washer. Better if their will be 2-3. From each Bud will grow a new stem, and the plant will become very decorative. When pruning dieffenbachia produces a lot of milky juice which is very poisonous. Be sure to wear gloves. The pruning will remove from the room of small children and animals. Even one drop of juice dieffenbachia, trapped in the mucous of the child, can cause severe burns and anaphylactic shock. To reduce the secretion of juice, stop watering the plants for three or four days before the procedure. Prepare the tool for the job. The trunk is grown dieffenbachia will drivespec, so working isn't sharp enough knife, you can frayed. It is best to use a thin hacksaw or a well-sharpened knife with teeth. Treat the cutting part alcohol to get into the wound, bacterial or Plesneva infection. After using the instrument, carefully wash with detergent to remove excess juice. The cut must be completely horizontal. To prevent the infection of the plant or rot, treat the cut with cinnamon or powdered charcoal. A tree stump can be closed glass jar, which should be regularly raised for ventilation. Reduce watering until you Wake up dormant buds. After that, carry out watering and feeding as usual. The top left after pruning, it is possible to root and later to plant the remaining stump. In this case, you will get a big lush Bush. If the cut off part is a long stem with a tuft of leaves at the end, cut it into several parts. Dieffenbachia perfectly replicates pieces of stem, even if they have no leaves. Before rooting crop slightly dry within one to two days. Korenaga apical part in water or in a damp mixture of earth and sand. If rooting in water, use an opaque dish. Water from time to time change. Dieffenbachia is one of the most poisonous plants of the family Araceae. It is not recommended to have it in the house with young children. Juice with randomly ablomingo sheet can be very dangerous. Often the victims become dieffenbachia budgerigars. Cats and dogs usually instinctively her hand, but still try not to risk it. If, having cut the long stem into pieces, you will get confused, where they have a bottom, and where the top, just lay them in moist soil horizontally. Dormant buds on the trunk facing up.